Nearly two-thirds of United Nations states agreed on Friday to a treaty to ban nuclear weapons after months of talks, which were boycotted by the United States, Britain, France and others who instead pledged commitment to a decades-old Non-Proliferation Treaty. The treaty on the prohibition of nuclear weapons will enter into force 90 days after 50 countries have ratified it. It was adopted with 122 votes in favor, one against and one abstention. U.S. Ambassador Nikki Haley, British Ambassador Matthew Rycroft and French Ambassador Francois Delattre said in a joint statement that their countries do "not intend to sign, ratify or ever become party" to the treaty. 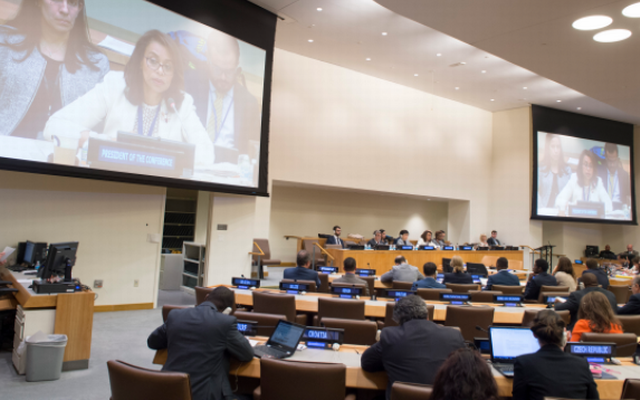 "Therefore, there will be no change in the legal obligations on our countries with respect to nuclear weapons," they said. "A purported ban on nuclear weapons that does not address the security concerns that continue to make nuclear deterrence necessary cannot result in the elimination of a single nuclear weapon and will not enhance any country's security, nor international peace and security," they said, citing North Korea. Pyongyang's latest missile tests and claims that its newly developed intercontinental ballistic missile (ICBM) can carry a nuclear warhead have alarmed the United States and other countries. At the start of the talks in March, Haley said dozens of countries were skipping the negotiations because they were committed to the Non-Proliferation Treaty, which entered into force in 1970 and is aimed at preventing the spread of nuclear weapons and weapons technology. The U.N. General Assembly resolution adopted a resolution in December, 113 in favor to 35 against, with 13 abstentions, to "negotiate a legally binding instrument to prohibit nuclear weapons, leading toward their total elimination" and encouraged all member states to participate.